Just past Point Loma Nazarene College in San Diego lies one of our family’s favorite hidden gems – Cabrillo National Monument. It’s got great views of San Diego Bay, the downtown San Diego skyline and Coronado Island, but that’s not the best part. Named for Juan Rodriquez Cabrillo who was the first European to sail into San Diego Bay on September 28, 1542, the monument covers the tip of Point Loma. 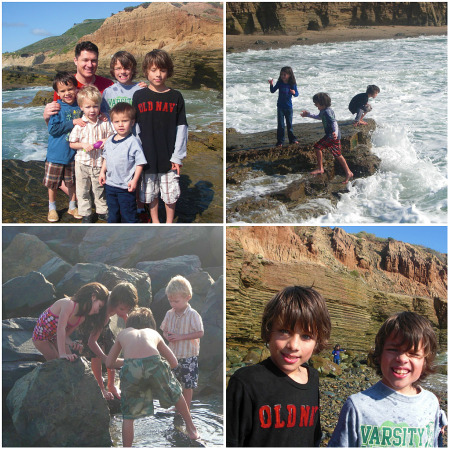 Down on the side facing the Pacific Ocean, lies the rocky tide pools where the kids love to search for crabs, sea anemones and whatever else gets washed up into the pools by the tide. And there’s even some hard to reach sandy beach areas that take a bit of a hike (along the marked trail) to reach, but are well worth it. 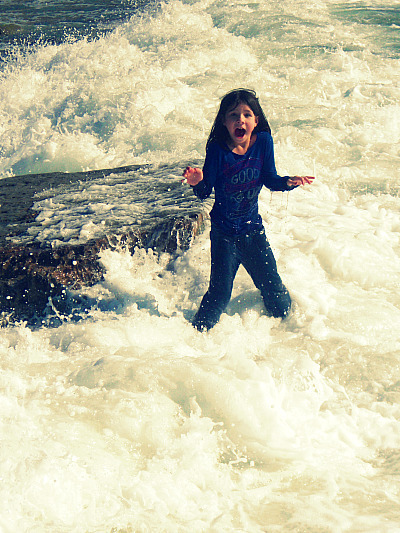 For three of the five days we were in San Diego recently, the kids begged their way to explore, climb, run and wade into crevices, corners and caves all along the shoreline. We always seemed to get wet somehow, but it was fantastic fun and the best part – a week long pass is only $5 (thanks to your tax dollars)! In truth, we did actually run into, pardon the pun, a crabby old man who didn’t like the fact that Noah opened the Yukon door and slightly bumped his car. Which a mark it did not make. After a quick inspection revealed as much, he huffed away and slammed his door saying, “You need to get these kids under control!” We all laughed and continued to enjoy our vacation and felt a little sorry for unhappy people. After looking at the San Diego Bay for a few days, it was time to get out on it. 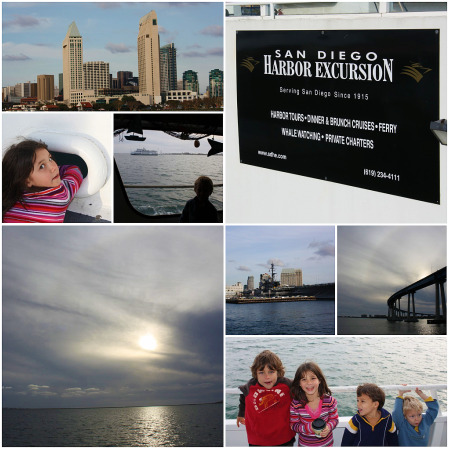 That’s why we headed over to the San Diego Harbor Excursion that’s located next to the cruise ship landing. Of course, we had to stop in first at The Bay Cafe for a snack. We opted for the one hour South Bay cruise which took us out into the bay, under the Coronado Bridge (which is tall enough for Navy ships of any size to sail under anytime), and all along the Naval Base San Diego, which is the largest such military installation on the West Coast and home to the Pacific Fleet. If you like the Navy, this one’s for you. The tour guide knew every detail about each of the dozens of ships, all the way down to maintenance schedules for painting and dry dock. Next time I think we’ll try the whale watching cruise, which is a half-day trip out into the Pacific where you can see gray whales migrating from Central America to Alaska. On second thought, maybe I’ll make this one with the twins and Julia; might be too much for the little ones since they seemed to be done after an hour. .-= Lori´s last blog ..Still Trying to Believe =-. They would have a blast on your ranch, Lori!